Walk along the MBTA right of way west from Dutton Road and the tree-lined pathway quickly transports you into a different world with sights and sounds of the upland woods and wetlands. Ponds, marsh, and swamp run intermittently along both sides of the track. Posts with pink tape marking wetlands are easily spotted while walking along, bringing home just how closely the wood and wetlands live in symbiotic balance. Sudbury is covered by more wetlands than nearly any other community in Massachusetts, with multiple rivers, streams, vernal pools, and ponds. Our town’s own bylaws reflect the importance of wetlands in our history and today. 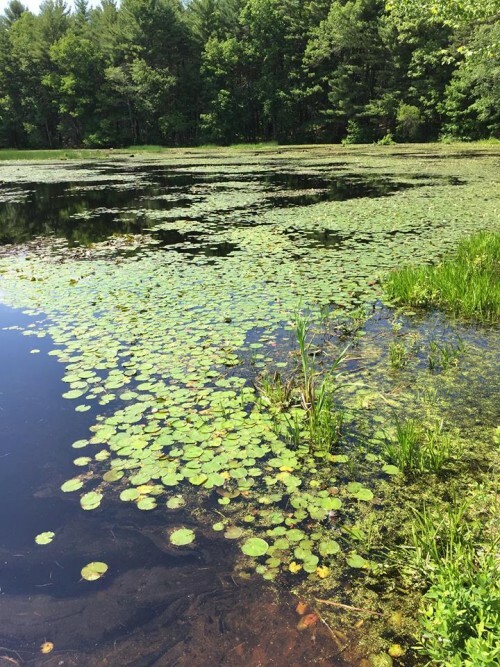 In 1994, Sudbury Town Meeting approved a Wetlands Administration Bylaw adding our own local restrictions to the 1972 Massachusetts Wetlands Protection Act. The town bylaws are further governed by 2014 revisions of the Sudbury Wetlands Administration Bylaw Regulations. And although sometimes home owners’ plans for renovation, expansion, and landscaping are foiled by the restrictions these regulations impose on us as landowners, a bit more reflection reveals how important it is that our conservation commission remains ardent in protecting our wetlands. Wetlands are one of the most gloriously productive ecosystems in the world and play an invaluable part in water management, protecting and improving water quality, trapping and storing floodwaters, feeding downstream waters, filtering excess nutrients, pollutants, and sediment that would clog waterways and affect fish and amphibian egg development, and helping recharge groundwater supplies. Wetlands also host an immense variety of species from microbes, to plants, insects, amphibians, reptiles, birds, fish, and mammals. Many species of birds and mammals rely on wetlands for food, water, and shelter, especially during migration and breeding. Their shallow waters and high level of nutrients mean they are rich in growth, providing the base of the food web. Also of particular note in Sudbury are our vernal pools, which provide the only breeding habitat for a wide range of amphibians such as spotted salamanders and wood frogs. The small size and ephemeral nature of vernal pools mean that they are devoid of fish life, making them safe for breeding and hatching. They also provide food, water, and shelter for a wide range of other amphibians, reptiles, mammals, birds, and invertebrates as they travel through the woodlands. The pools themselves, because they are small and temporary, are also extremely sensitive to small changes in local tree canopy, vegetation cover, and nearby development. Apart from their ecological superpowers, wetlands also provide opportunities for recreation and aesthetic appreciation, benefiting us as individuals and creating value for the town as a whole. Hop Brook and Hop Brook Marsh, which Eversource’s transmission lines would bisect and disrupt, are an integral part of the Sudbury landscape and history, supporting plants and animals that give Sudbury its rural feeling and quality of life. Anything that threatens it, threatens us. On a global scale, wetlands are highly threatened, often being drained for development, losing their value as habitat and natural beauty. They also are incredibly efficient at storing carbon within their plant communities and soils, aiding atmospheric maintenance and becoming increasingly valued for their role in fighting climate change. Wetland habitat degradation in the US since the 1970s has been a leading cause of species extinction. Right here at home, Sudbury has extensive wetlands and a robust set of bylaws and regulations to protect them. Eversource seems to think that it can find a way to circumvent those laws and regulations and erect their transmission lines right through some of our most cherished conservation land and wetlands. Protect Sudbury and its members are working hard to stop them. Join the fight by attending a special town meeting May 3rd at 7:30 at LSRHS. Vote on Article 2 to fund legal counsel for the Town of Sudbury to oppose Eversource’s proposed transmission line project. Please note, we do NOT get to vote on the project itself, nor does the Town of Sudbury. The vote on Article 2 only addresses funding Town opposition to the project. Sudbury’s Board of Selectmen has said it opposes the Eversource “Reliability” project, both above and below ground. Let’s stop Eversource in its tracks. Vote Yes on Article 2. UPDATE: The vote at Town Meeting passed unanimously! Thanks everyone for turning out and voting.